It’s everybody’s second-most favourite time of the release again. No, not the actual release, but it’s Ubuntu Developer Week! 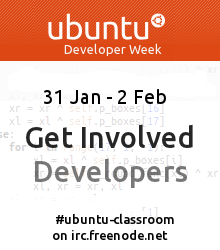 Join us from Tuesday, 31st January 2012 to Thursday, 2nd February 2012 for three action-packed days full of tutorial and hands-on session all around Ubuntu development. We spared no efforts to bring you a very diverse set of topics and a very diverse set of speakers as well. This time we managed get speakers from Australia, Brazil, Canada, Czech Republic, France, Germany, Hungary, India, Italy, Pakistan, Poland, South Africa, Spain, UK and USA. Packaging: find out how software is put into Ubuntu and how it’s maintained. We have a variety of hands-on sessions where Ubuntu developers share their experience with you. It’s the perfect time to get involved. Sessions: Intro to Ubuntu development, Getting set up, Dos and Dont’s, working with Upstream projects, building packages locally, using pkgme for automatic packaging, writing good changelog entries, distributed development and loads more. Quality Assurance and Bug Fixing: One of the greatest ways to contribute to Open Source is resolving problems. Not only for you, but for millions of users out there. Join in to find out from experts how to make Ubuntu even better. Writing code: we will talk about apps, tools, projects and infrastructure to make writing software for Ubuntu even easier. Sessions: automated testing, pair programming, code review, technology overview, introductions to many cool technologies and making your apps rock. Ubuntu projects and Ubuntu in the bigger picture: Ubuntu has grown dramatically and lots of different project make the awesomeness we release every six months. Find out who’s doing what and what’s new. Sessions: Ubuntu TV, Edubuntu, juju, the Cloud, Unity and Debian. Joining in is trivial. Use normal IRC (even a web browser will do) or install Lernid and connect. We put lots of effort into this great event. 31st January to 2nd February will be a great time and just for you. Bring your friends and your questions. As this is generally asked very often: yes, we will keep logs of all the session if you shouldn’t be able to attend. We will make them available on the Ubuntu Developer Week page.